It adopts the interlayer heating, the materials is inside 3mm, 304 stainless steel; outside 2.5mm, 304 stainless steel. And it has constant temperature. The machine adopts water heating or oil heating, with the function of mixing, heating, homogenizing, cooling, emulsifying and dispersing, etc. The main mixing adopts the CVT device, in low temperature, high viscosity reducing bubble formation. And the production efficiency is very high, can produce 500 kg of finished products in 30 minutes, and product quality is fairly stable. 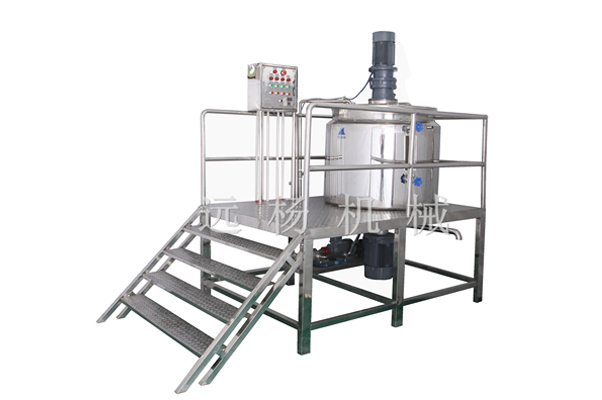 It is the most ideal equipment for currently medium-sized enterprises to produce shampoo, shower gel, auto water, table board wax liquid, hair conditioner, leather polishing agent, etc.